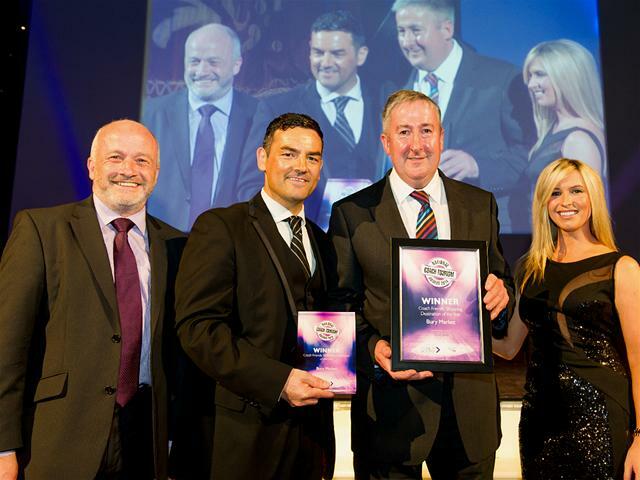 The award-winning Bury Market has won a major tourism award at the National Coach Tourism Awards 2014. At the prestigious award ceremony held in Blackpool's Tower Ballroom, the market won the accolade of Coach Friendly Shopping Destination of the Year. Bury's award came with recognition of its "outstanding service in promoting its famous market". The category was very competitive with the four finalists being Ashton Market, Bury Market, EnaMill, and Gloucester Quays Outlet. Work has started on building new customer toilets on the market, installing an ATM machine, and a re-roofing programme which will be welcomed by visitors. Pictured are: Stuart Render (Editor Coach Monthly) Luke Galliana (Group Sales Manager EXPO Mgt) Andrew Heyes (Markets Manager) and Brooke Kinsella (Television presenter).